Cheshire Cat Photo Blog (… said the Cat: 'we're all mad here….') 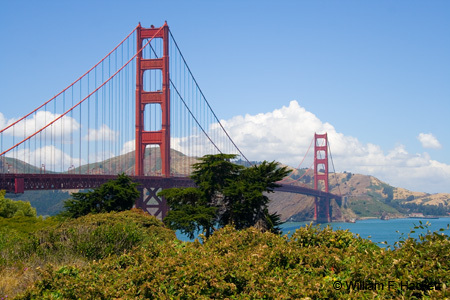 » Blog Archive » Golden Gate Bridge pedestrians hit by 5″ blow darts! The California Highway Patrol (CHP) said that TWO pedestrians were hit by 5-inch darts from a blowgun on Friday. At about 2:45 pm, a CHP officer patrolling on a bicycle was called over by a man who had been hit by a 5-inch dart from a blowgun that had penetrated two inches into his thigh. The officer called an ambulance. As emergency personnel were attending the man, a woman who had been hit in the knee by an identical dart approached them. Both victims were evaluated and released. CHP confiscated the darts to have them tested for harmful chemicals. Officers are seeking video footage of the crime. People with information should call the California Highway Patrol Marin Area Office at (415) 924-1100. "Golden Gate Bridge pedestrians hit by 5″ blow darts!" was written on February 13th, 2016 by Bill, and filed under California,Photography,Uncategorized. Previous: SF’s January rain was greater than past 5 combined! Next: Iran sentences billionaire, Babak Zanjani, and two of his associates, to death!